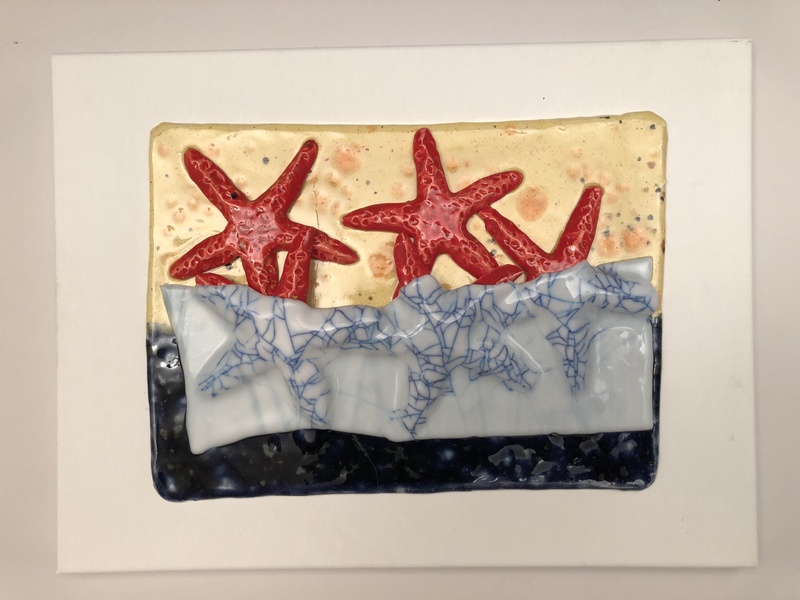 The “Dreaming” titled ceramic pieces from my studio, beachfront Pottery, refer to the inspiration behind the artistic concept of these pieces. That inspiration is from the Australian Aborigine culture that holds dreaming of select members of the aborigine group in high regard. Those Aborigine dreamings represent information about the past actions of their ancestors, and, therefore, those dreamings are considered sacred. Any particular dreaming may be communicated to the rest of the group by drawings it, but because the drawn dreraming is still sacred, as a protection of that sacred entity, the drawn dreaming is obliterated, covered up by poking the image by sticks. The Starfish Dreaming pieces have the starfish themselves as sacred critters, and the crackled glass is covering up the sacred critters. The dream of these starfish is to be in the blue ocean, as opposed to be the beige/yellow seashore. 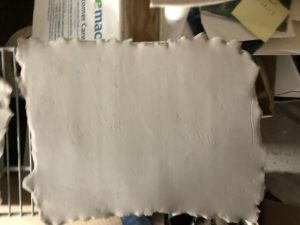 This is the rolled out earthenware clay slab before bisque firing. 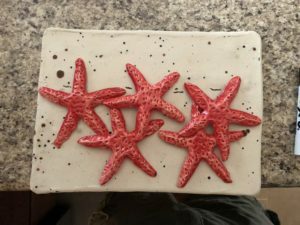 Once the clay slab and the starfish are glaze fired, the starfish are arranged on the slab. 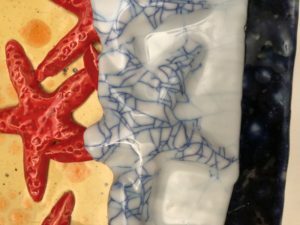 You can see the dashed line where the blue and yellow glazes will be layered. 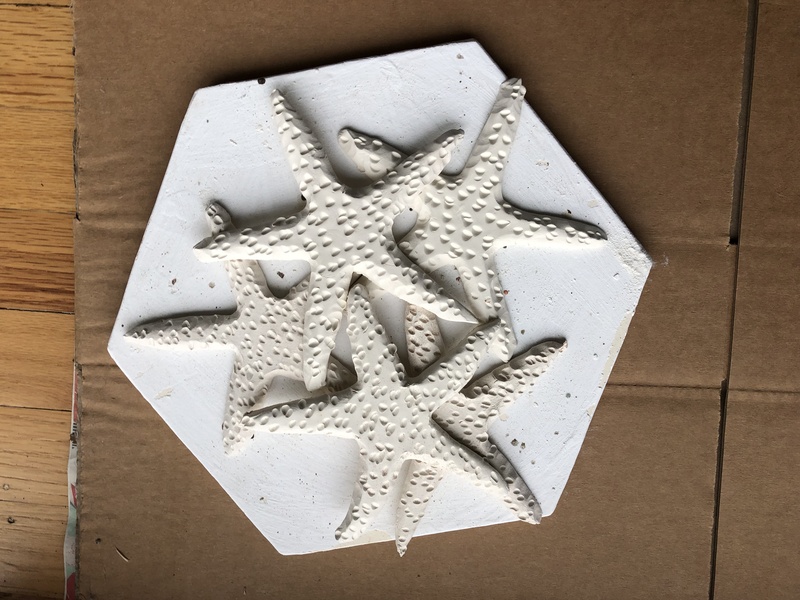 Glaze firing at this stage aims to fuse the starfish to the slab. 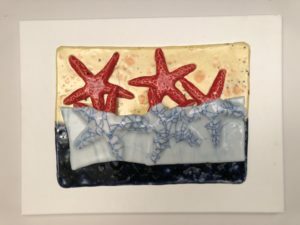 The slab has Safari:White Cascade glaze mix; the starfish have Firecracker glaze. Here is the result of the final bisque firing. 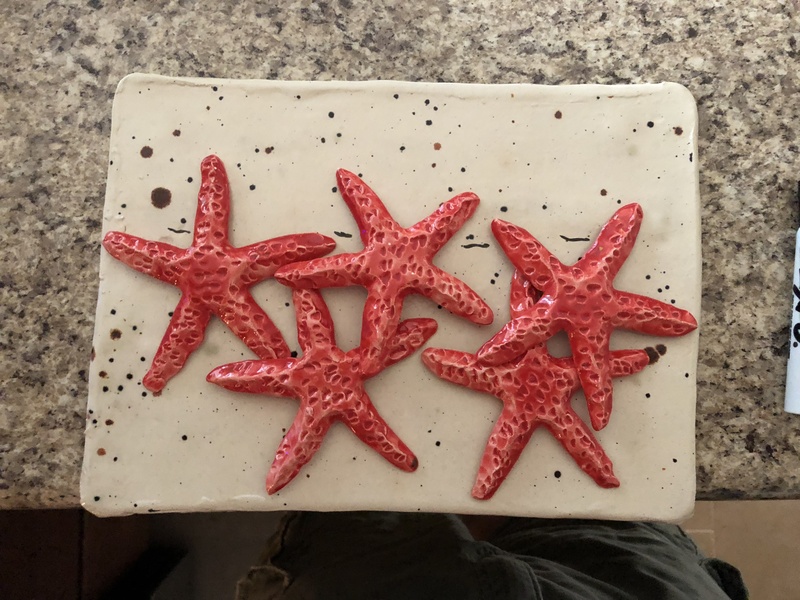 The starfish are solidly fused tot he slab. You can now see the proportioning of the two differently colored glazes on the slab. The slab has Blue Lagoon and Citrus Splash glazes. The next step is to cut a piece of white glass sheet, place it onto the glazed piece. 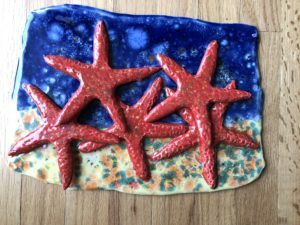 The glass firing at con 016 will melt the glass enough to slump over the starfish, and to stick to the slab, but not enough to melt the glass completely. The picture on the right shows best how the glass slumped over the starfish shapes. During cooling the glass crackle, and I enhanced the crackles with small amount of India Ink. The picture on the left shows the entire piece on a canvas panel. 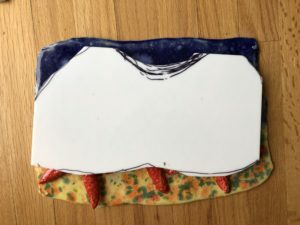 The ceramic piece is glued to the canvas panel, and the framed before exhibit showing. Final size: 12X16 inches.